Dr. Chelsea Davis’s research focuses on the surface and interfacial mechanics of soft matter. Utilizing mechanoresponsive fluorescent sensors coupled with established mechanical properties characterization methods, her work seeks to further our understanding of contact formation and separation mechanisms between dissimilar materials. Potential applications of her research are self-reporting damage sensors for fiber reinforced composite systems and adhesion control/enhancement of thin film polymer coatings on metal and ceramic parts for corrosion resistance. Dr. Davis received a B.S. in Textile Engineering from North Carolina State University in 2005. She then obtained her M.S. and Ph.D. in Polymer Science and Engineering from the University of Massachusetts Amherst in 2007 and 2012, respectively, supervised by Dr. Alfred Crosby. From 2012-2013, Dr. Davis was a Michelin Postdoctoral Research Fellow at the ESPCI ParisTech working with Dr. Costantino Creton and Dr. Anke Lindner. She went on to complete a National Research Council Postdoctoral Fellowship in the Polymers and Complex Fluids Group at the National Institute of Standards and Technology (NIST) with Dr. Jeffrey Gilman from 2013-2015. Dr. Davis then transitioned to the role of Materials Research Engineer within the Materials Science and Engineering Division at NIST. In January 2017, she joined the faculty of the School of Materials Engineering at Purdue University as an assistant professor. Mitchell received his B.S. in Materials Science and Engineering from Purdue University in 2016. During college, he interned with American Electric Power assisting with failure analysis of high energy boiler tube systems and welding qualifications. Also, he interned with the Edison Welding Institute researching novel ways to create forming limit diagrams for aluminum alloys at elevated temperatures. He is now pursuing his doctorate in the School of Materials Engineering at Purdue University. Mitchell's research focuses on the buckling mechanics of thin film polymers particularly the mechanical characterization of cellulose nanocrystals (CNCs) and the interfacial failure of fiber reinforced polymer composites utilizing mechano-chromic fluorescent probes. Hyeyoung received her B.S. in Materials Science and Engineering from Seoul National University of Science and Technology in 2009 and her M.S in Nanotechnology from Hanyang University in South Korea in 2011. After graduating, she worked for four years at Samsung Electronics as a process engineer. Now, she is pursuing her doctorate at the School of Materials Engineering at Purdue University. Hyeyoung's research focuses on the experimental investigation of soft materials interfaces utilizing custom-built adhesion testing equipment, fluorescence characterization techniques, and thin film buckling mechanics. Naomi Deneke received her B.S. in Chemical Engineering from Prairie View A&M University in 2017. As an undergraduate, she conducted research on protein-loaded hydrogel membranes for ocular drug delivery. She also completed a year long co-op with Dupont as a production engineer intern and a summer internship at Sandia National Labs as a purchase product engineer. Naomi joined the Davis Research Group in September 2017 and is now pursuing a doctorate degree in the School of Materials Engineering at Purdue University. Naomi’s current research focuses on the investigation of polymer interfacial formation utilizing fluorescence/Förster resonance energy transfer or FRET (a distance-dependent transfer of energy between two chromophores). Her initial efforts are focused on the development of a double cantilever beam (DCB) mechanical testing experiment to calibrate FRET response with separation distance for rigid polymer systems. Allison’s current research focuses on validating a technique developed by Hyeyoung to quantitatively measure the adhesion between glassy polymeric thin films and compliant substrates. This method exploits the wrinkling-to-delamination (W2D) transition that occurs when the film-substrate system is placed in lateral compressive strain. This method has previously been validated using polystyrene (PS) and poly(methyl methacrylate) (PMMA) as the thin films and poly(dimethyl siloxane) (PDMS) as the substrate, all of which are well-characterized materials. Allison is focusing on expanding the range of materials used to validate this technique by utilizing materials with a wider range of surface energies to determine the boundaries of this W2D adhesion measurement technique. Teflon AF 1600, a low surface energy copolymer of Teflon, will be utilized as the thin film while polyacrylamide (PAM), a high surface energy polymer, will be utilized as the substrate. Nolan is an undergraduate in Material Science and Engineering at Purdue University. He has worked with NeuroConnexions to redesign an optical therapy device to aid patients with poor vision. 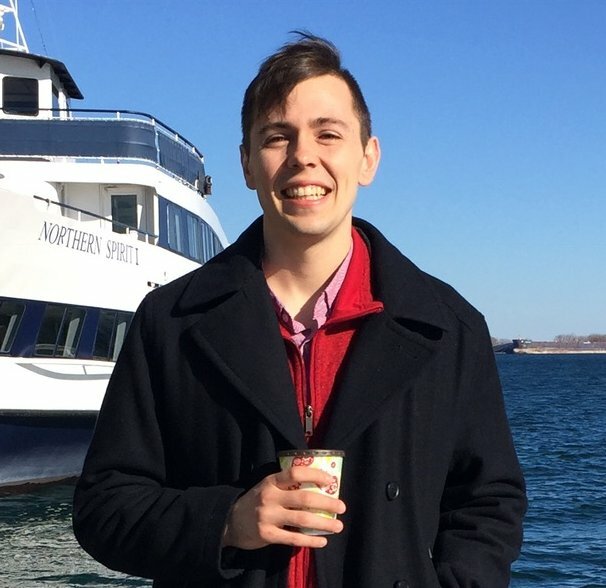 Nolan's current research focuses on determining the stiffness of neat cellulose nanocrystal (CNC) thin films utilizing thin film buckling mechanics, atomic force microscopy, and birefringence. 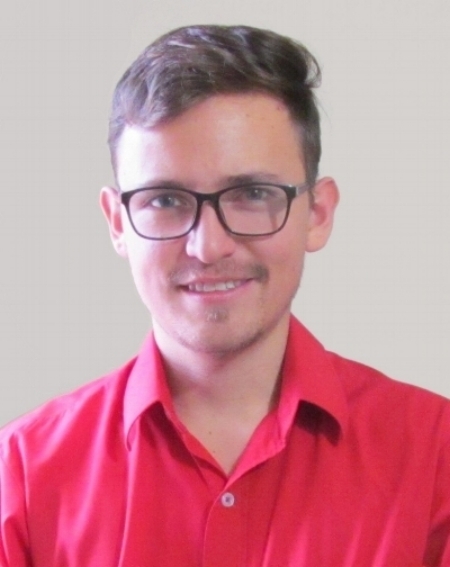 To quantify the local deformation of polymeric materials, Juan is designing a system that correlates the visual effect of mechanically sensitive particles, called mechanophores, to the deformation of a material using the backbone of an elastomer and a scale. By attaching fluorescent tracer particles to the surface of an elastomer, Juan will obtain trajectories of the material's deformation by using particle tracking technology and confocal microscopy. Abby is a junior studying Materials Science and Engineering at Purdue University. She held an internship as a metallurgical intern with ArcelorMittal at the 80” Hot Strip Mill at the Indiana Harbor facility. As an associate engineer for quality assurance, she monitored temperature dispositions, diagnosed causes of cracked steel, and investigated different test results. Abby’s current research includes helping Allison validate Hyeyoung’s adhesion measurement technique. Using the wrinkling-to-delamination (W2D) transition that occurs when the film-substrate system is compressed, the adhesion between thin films and substrates can be quantified. This method will be tested further with polymers of different surface energies.